I doubt that I need to sell you on the benefits of blogging. I’m sure you already know how blogging helps you get more traffic and/or customers. But what I might need to sell you on are the benefits of blogging smarter. You’re trying to juggle topic ideation, content creation, promotion, along with everything else on your plate. Yeah…there comes a point when you need help. Enter, the editorial calendar. 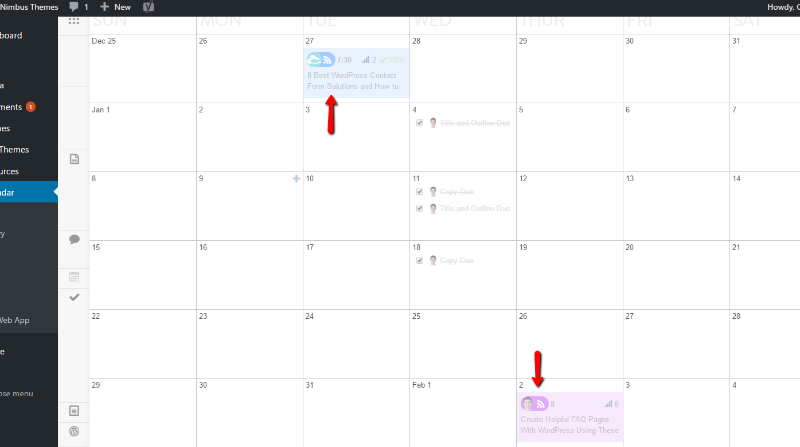 What is An Editorial Calendar and Why Do You Need One? How do you decide what to post on your blog? Is it a spur of the moment thing? Do you just think, “Hey, I haven’t posted on my blog in a week, I should probably come up with something”? Don’t feel shy if you do. I think most people fly by the seat of their pants when it comes to content strategy for their blog. But it’s really not the best way to run your content. Instead, you should develop an editorial calendar. An editorial calendar is basically your content roadmap. It plans out your content weeks, or ideally, months in advance. You’ll know when each piece needs to be finished and how everything ties together. You can create an actual unified content strategy, instead of just publishing whatever feels good. You can make your posts work together for promotion, SEO, and user engagement. It’s easier to promote your articles because you know when each topic will be published far in advance. Planning posts out on a calendar forces you to be consistent. No, “Oh, I’m busy. I’ll post next week.” You have to post because it’s on the calendar! You’ll have less stress in your life because you’ll no longer have to scramble for ideas/content at the last minute. One way to create an editorial calendar is to just… write it down. You can use Excel, Google Calendar, or good ‘ol pen and paper. But there’s also a better way. And that better way is named CoSchedule. What Does CoSchedule Help You Do? 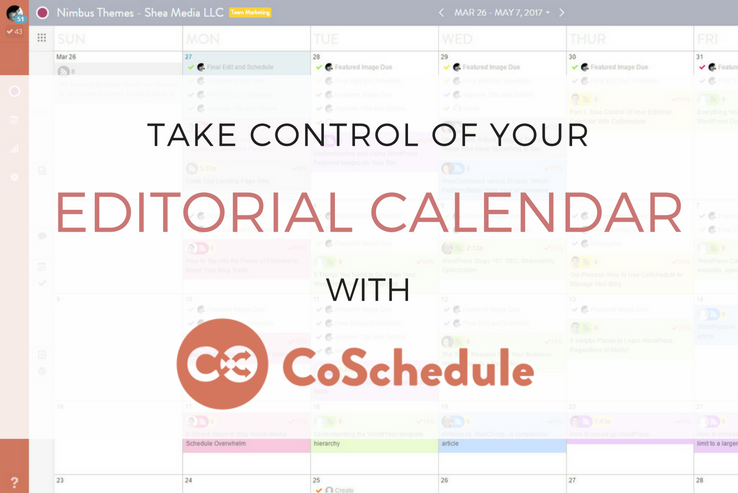 CoSchedule is your editorial calendar, social media promotion, and task management tool… all in one. 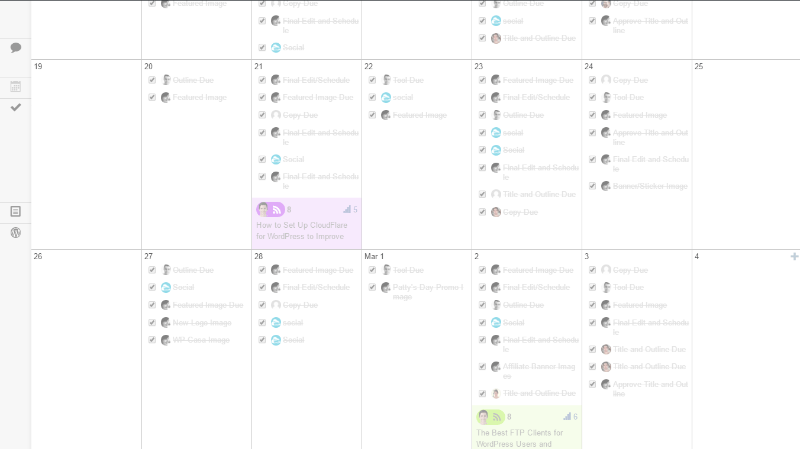 First, it gives you a real calendar that you can look at for a high-level overview of all your upcoming content. But it’s much more than just a calendar – for each post, you can also divide up and assign tasks (which can be checked off), plan your social media posts in advance (and have CoSchedule automatically post them), and more. Let’s take a deeper look at all of the features you get with CoSchedule. This is my personal calendar on Nimbus from back in December. As you can see, I had two posts scheduled for publishing during this time period. What everyone else is working on. What you yourself need to accomplish. Thanks to CoSchedule, each team member knows exactly what’s happening and whether or not the task has been completed yet. If you create a ton of content, having to manage communication and approvals can quickly become a massive pain. Finish the post, email it to someone for editing, get back the edits, schedule it… confusing. Unless it’s all in one place. Then, it’s actually not so bad. No need to alt-tab to your email client or Skype! Up until now, I’ve mainly focused on the content creation benefits of CoSchedule. 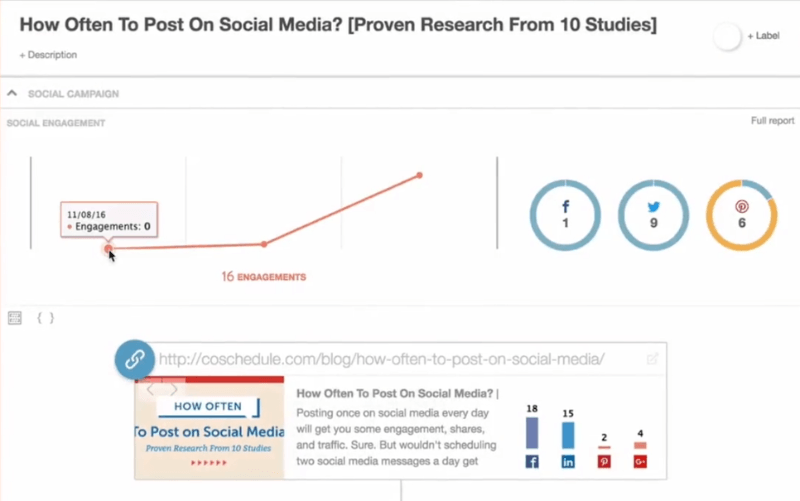 But CoSchedule also includes tons of features to help you promote your content on social media. See, as part of each post’s workflow, you can plan out your social media posts. 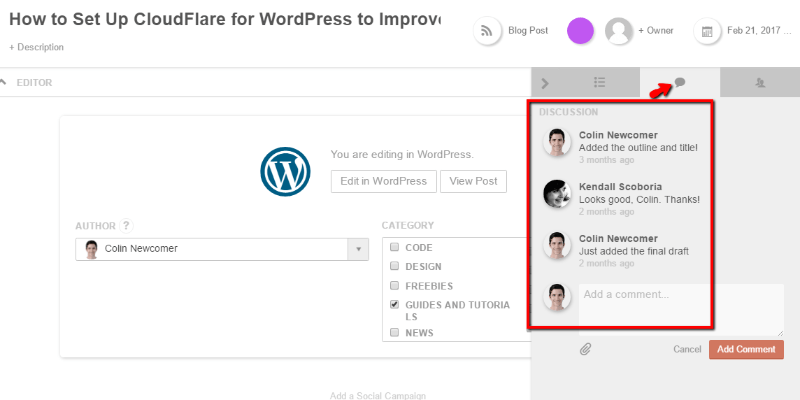 If you’re familiar with Buffer, it’s kind of like that… but built into your workflow and directly inside your WordPress dashboard. 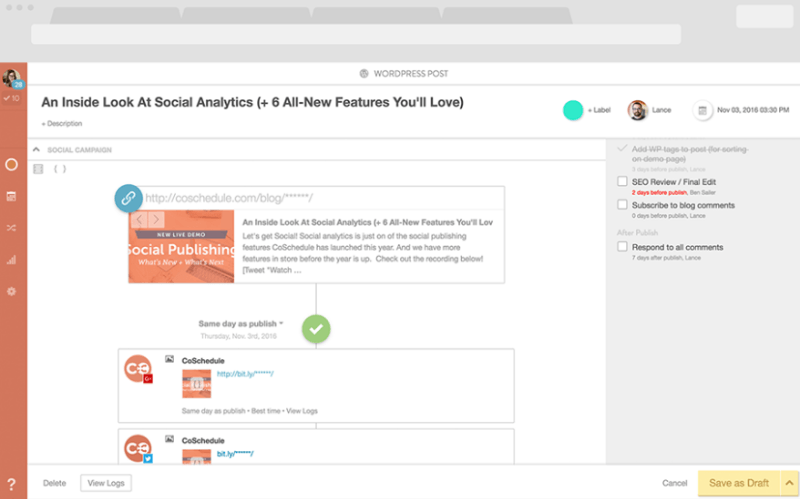 And you’ll also be able to preview all of your social media posts on a calendar, just like you can with your blog posts. Even cooler, CoSchedule will automatically help you find the best time to share your content so that it gets in front of as many eyeballs as possible. And because you’ll probably want to share multiple messages, CoSchedule lets you bulk schedule using a pre-made template. That saves you time. CoSchedule isn’t just about driving social traffic to your new posts, either. They also include features to help automatically reshare your old content. Why is that important? Because resharing old content on social media can get you more engagement. And when you consider that both Facebook and Twitter have been consistently reducing the reach of organic posts, it becomes even more essential to reshare old content to ensure that your followers actually get a chance to see it. With CoSchedule’s ReQueue feature, CoSchedule automatically fills the gaps in your social media posting calendar with shares of old posts. That way, you’re never wasting social media posting space. ReQueue is an additional fee on top of your existing CoSchedule plan, though. Unfortunately, though, the analytics features are not available on the lower tier plans. Need help organizing all the steps involved in creating content for your blog? @CoSchedule can help. Who Is CoSchedule Built For? CoSchedule is built to give value to both individuals and teams. If you’re an individual, you can take advantage of a lower cost plan that still gives you the editorial calendar and to-do list features, but without any of the team workflows. You’ll still get value because you can plan out your content and social media strategy, but you won’t get any of the features that make CoSchedule great for teams. On the other hand, if you are a team, you’ll greatly benefit from the improved workflows (as well as all of the other features). You’ll just need to pay a little more for them. How Much Does CoSchedule Cost? CoSchedule currently offers four different plans. They do a good job naming each plan to give you an idea of who its features are geared towards. Solo Marketing – $39 per month – Geared towards solo practitioners because it lacks the team workflow features. Team Marketing – $79 per month – Ideal for small teams of fewer than 5 users. Team Pro – $359 per month – Offers more analytics and features, as well as more users. Cost prohibitive for small organizations, though. Multi-calendar – ~$1,600 per month – Really only for enterprises or other huge organizations. In this post, we mainly focused on an overview of CoSchedule’s features in an abstract sense. In the next post in this two-part series, we’ll show you exactly how we use CoSchedule on the Nimbus Themes Magazine. If you’re still unsure of how all of these features tie together in real life, the upcoming post will give you a real world example.